Early childhood educators prepare children who are usually under the age of five to enter the American school system. Parents often like to be involved at this stage in a child's education, so these teachers navigate interactions with their young pupils and parents, helping children develop social skills in addition to fundamental skills like reading, writing and math. 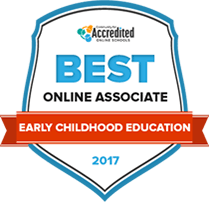 See how online associate degree programs help future early childhood educators acquire the necessary qualifications before gaining experience on the job. Prospective students pursuing an online associate degree in early childhood education have several factors to consider when choosing an online program. To help refine their individual searches, students can sort through programs by tuition cost, graduation rates, student-to-teacher ratios, services available outside of graduation and financial aid opportunities. One place to start is by taking a look at 2017's top-rated programs listed in the rankings below. Students can earn an associate of arts in early childhood education degree, or an associate of applied science degree with either an infant/toddler emphasis, a preschool emphasis or an emphasis on administration of early care and education programs. Online students will have access to a range of students services, including career counseling, personal counseling, and drug and alcohol dependency prevention services. The school promotes inclusion through a disability resource center and an equity and inclusion office. The school also reaches out to students through a suicide prevention hotline and the Getting Ahead Program. An associate degree in education at Eastern Wyoming College can help students on the path to a career in the field. Articulation agreements with area colleges help to reduce the overall cost of a higher degree by getting general education credits and prerequisites out of the way early. The school has a number of outreach campuses across the state as well as online learning opportunities. Students can earn a number of degrees and certificates online via the internet or web conferencing. Some programs require additional on-site practical experience which students can generally schedule at a location convenient to them. Yavapai College offers 9 degrees and 17 certificates through online learning programs, serving about 5,000 students. These offerings give students better access to earning a degree, paired with the ability to maintain personal and professional obligations at the same time. Students use the Canvas online learning program to view lectures and communicate with their professors. Additional eLearning support is also available, including a tutorial video series, to ensure students are successful. An online orientation also gets students started on the right foot with both online learning and college life. The early childhood education program at Haywood Community College prepares graduates for a career working with young children in diverse learning environments. Students can take courses online or on campus, with added on-site practicum experience to learn from real-life situations. They use the Moodle online learning system, which has video tutorials and other online support for the distance education student. A help desk, learning support services and new student orientation help ensure that students have the tools and resources they need for success. Aspiring and current early childhood educators can get the training they need to begin or advance their career in the field at Bladen Community College. Depending on the program, students may be able to complete all coursework completely online. This flexible option helps students maintain other commitments while advancing their careers. In addition to this completely online option, students can earn other degrees online as well through web-assisted, interactive television and hybrid options. The college has articulation agreements with area institutions to help accelerate students to a bachelor’s degree. An online early childhood education degree from Casper College puts graduates on the track to a bachelor’s degree in the field. In addition to the education degree, the school offers six other fully online programs and many others that are available 70 percent or more online. Using the Moodle Open Source course management software, students log in to view course materials and participate in discussions with fellow students and instructors. Tutors are available to help if students need assistance with a course, and a help desk is available for those who need assistance with the platform. While most classes are asynchronous, students are encouraged to log in to participate daily. Arizona Western College offers more than 100 degrees and certificates, many of which are available online. It offers four education degrees and four certificate programs with online classes. Some of these may also include in-person practical experience. Transfer degree opportunities allow students to go on to earn a bachelor’s degree while the occupational degree option lets students go to work in the field right away. Online students use Blackboard to access their coursework and students also have access to both the AWC library and the Northern Arizona University library. Graduates of Cleveland Community College’s early childhood education program are prepared to work with young children, through age eight. Students can earn their degree online, where they take quizzes, chat with other students, communicate with their instruction and access all course materials. An academic resource center is also available to online students. The college, which was established in 1965, also provides workforce development programs, on-campus events, a textbook exchange program and a number of student clubs and activities. The Virtual Classroom technology at Colorado Northwestern Community College allows early childhood education students to learn and advance their careers from the comfort of their homes. The program is delivered in a synchronous manner, at the same time each evening. Instructors are experts in their fields and provide lectures, group activities and demonstrations to students—via the internet. A Virtual Classroom training is required to ensure student success. The college serves about 1,000 students and offers about 20 online degree and certificate programs. The early childhood education program can result in either an associate of arts degree or an associate of applied science degree. The AA degree is designed for students who wish to transfer to a four-year college to earn a bachelor's degree in early childhood education, elementary education with an endorsement in early childhood or early childhood unified education. Since a background check is required for work in the field, students must submit to a check before practicum courses. several other community colleges in Nebraska participate in the online program. Most of Northeast Community College students either continue their education or find jobs after they graduate. Comparing early childhood education programs side-by-side can be helpful in determining where to apply. As many elements contribute to the selection of a well-suited program for an individual interested in applying for an online associate degree in early childhood education program, students should be aware of their unique priorities and career goals. Students can use the search tool below to sift through quality programs based on a number of factors, including cost, type of school and student population. Just as with on-campus programs, online education program applicants must convince admissions professionals that they will do well in an early education associate degree program. Once accepted, a student learns about the stages of child development and how to prepare children for school. Graduates can go on to teach preschool immediately after receiving their degree and licensure, but for some program students, an associate degree may only be the first step in their educational careers. Learn what to expect during each year of study in the online associate degree in early childhood education timeline below. After finding a program, it is important for an applicant to communicate to the admissions committee why they will succeed in that program. Program applications consist of objective data like grades and financial information, outside opinions in the form of recommendation letters, and an applicant’s own explanation for their interest in the program and how they will use their degree. Applicants to online early childhood education programs must have a completed high school diploma or GED. Programs may ask for these transcripts to be sent from the applicant’s previous school, as any transcripts sent by a student are not considered official. Degree programs want to know an applicant's academic and career plans in the field of early childhood education. A personal statement explains an individual’s goals, interest in the field and why an applicant is interested in this particular early education degree program. Working with children involves background checks and fingerprinting to ensure that children are safe. Applicants should be able to pass these required inspections. Students may need to gain practical experience with young children as part of program graduation requirements. They should check that local childcare centers will allow them to work and fulfil these course hours. Students will learn the developmental stages of child psychology, how to care for children at these varying levels of emotional and mental development, and how to cultivate personal growth in individual children. Though students are not taking classes on-campus, they may need to find positions in local childcare centers for practical work credits. If work credits are required throughout the entire program, students who are already working in the field often can remain at one center to fulfil these requirements. This program learning goal explores lesson planning at several stages: how to organize day-to-day activities, monthly or quarterly goals and long-term education outcomes. Students will learn how to break down educational goals into small steps that they can teach to children in manageable, age-appropriate ways. Because good habits are established early in life, students will learn how to impart health, safety and nutritional information to their students. They will also learn how to manage their own health and the health of their pupils in childcare environments. Students will learn how to comfortably work with infants, toddlers and preschoolers. Students will study the developmental stages of each age-group, learning care, teaching strategies and the essential qualities of education for each phase of childhood. oStudents will learn how to identify and address disabilities that affect childhood development, and they will examine the legal implications of having students with special needs. They will also learn to create an inclusive, respectful, nurturing classroom environment for these students. Because family plays such an important role in early childhood development, students will learn to cultivate parent involvement in the classroom and to connect children with the world of adults. Most online early childhood education programs will have exams at the end of each class, the end of each semester or the end of each school year. Students may be responsible for finding local licensed proctors to administer these exams. Online associate degrees in early childhood education prepare students to teach in a classroom. After fulfilling all state licensure requirements, students are generally prepared to join preschools or other early childhood centers. Other students may want to continue to explore child development, learning outcomes, teaching strategies and other aspects of early childhood education. These students may go on to pursue a bachelor’s degree in early childhood education either right after earning an associate degree or after a year or two of practical work. Every online associate degree program has learning outcomes that students are expected to understand by the time they graduate. Additionally, a specific minimum grade point average and a final project for students to demonstrate their knowledge may be required. Transferrable credits vary from program to program, so students interested in transferring to a bachelor’s program should check that they have fulfilled early prerequisites. Most higher-education programs will evaluate a student’s current transcript and propose a plan to complete prerequisites. Some states have articulation agreements that allow accredited online associate degree program graduates to join state colleges for degree completion if they have passed certain courses. Individual colleges may also have articulation agreements between associate and bachelor’s degree programs, which makes it easier for online associate degree students to enter higher degree programs. Teaching young children in a classroom setting is one career option for early childhood education associate degree program graduates, but there are many early childhood learning opportunities ranging from foreign language immersion programs to government-funded programs targeting low-income students. Early childhood education graduates can also work from home as daycare facilitators or as a caregiver for a family. Learn about possible opportunities to help young children discover the joys of learning below. Professionals in this field teach children up to age five before they enter kindergarten. They teach basic reading and writing skills, science, math and other subjects using lessons younger children can understand. They may follow a local school district schedule or work year-round at public or private schools, childcare centers or charity organizations. Childcare workers can provide childcare services in daycare centers, in their own homes or in their employer’s homes. They take care of children when parents or other family members are unavailable and may help prepare children for kindergarten in addition to assisting with basic needs such as feeding and personal hygiene. These professionals work under classroom teachers, providing additional support. Duties may include reviewing material with individual students and giving extra support as needed, helping the teacher keep records and prepare materials for lessons, and supervising students. They work in schools, childcare centers and religious organizations. They may work part-time and typically do not work during the summer. Children grow and learn at different rates, and early childhood is an especially rapid time for development. It is important to engage children physically, emotionally and mentally at every stage. Students in associate degree programs learn how to interact with children in each stage of development. Establishing a clear curriculum to develop children's social skills and cognitive development is an essential part of early childhood education. Early childhood education programs explore some styles of teaching that students can use in the classroom and many learning styles that children may exhibit depending on their development and personal interests. Different states have different standards for early childhood education associate degree graduates; some states only require an associate degree, while others have state-specific licensure exams and professional certification standards. Accredited associate degree programs should note individual state standards for early childhood educators while also preparing students for state licensure. Young children require a lot of attention and care as they learn and grow, and while early childhood educators provide some of this guidance, parents and other adults influence children as well. Associate degree students learn to engage a child's community to cultivate development, enforce social and emotional lessons, and encourage healthy interpersonal communication at this early stage in a child's life. Most online early childhood education associate degree program graduates will go on to teach children in a preschool setting. The following websites have resources that teachers can use to construct lessons for their young students. This organization offers research and resources for early childhood teachers, including plans and training modules for teachers working with specific age group and strategies for handling difficult children. This website provides information on early childhood education certifications and job listings. The website also has a blog written by current early childhood educators with tips and practical advice. Current teachers have articles on this website and provide lesson plans to incorporate into early childhood learning. There are also resources for state licensing and job listings. This governmental office provides local programs preparing young children in low-income families for school. Their website has many educator resources, and their programs employ early childhood educators. In addition to providing educational materials to elementary and middle schools, Scholastic is also a resource for curriculum ideas, child development articles and school-home connection solutions.